FLUSHING, Queens (WABC) -- Parents and students are protesting and asking for the removal of their interim principal who could at some point become permanent. 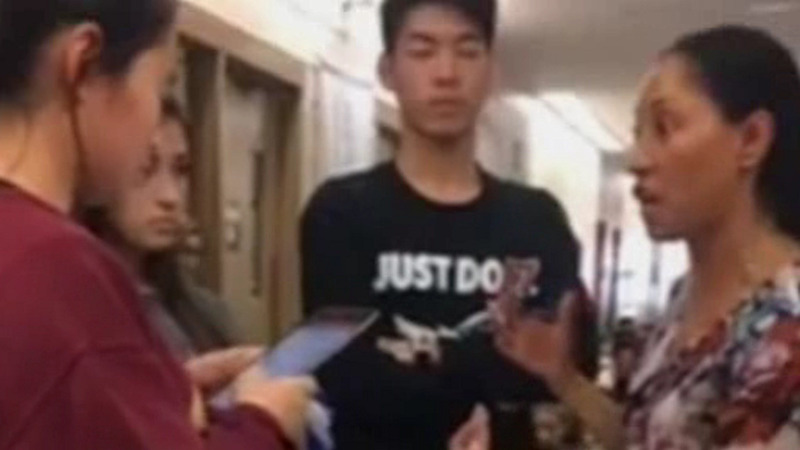 It was a tense showdown between students and their interim principal in Queens. an academic powerhouse in the city. More than a hundred students were seen protesting back in December to get Interim Principal Rosemarie Jahoda out. She started there in September, but by November, students say it was clear this marriage was heading for divorce. That's when students say they noticed teachers coming out of Jahoda's office in tears. And then they say she did it to students. "They were feeling like they were being interrogated as if they did something wrong and they didn't understand why she couldn't just reach out and help," said Alex Chen, President of Student Union. Chen is talking about two students who were allegedly harassed for being Muslim. Parents too say they have had enough. "Every single week there's something new going on. Where she's out of line, things are being canceled or delayed rather. Recently it was the mid-year report grade which had to be sent to colleges," said Susan Karlic, PTA Co-President. Students and parents say what's even more troubling is that there is a pattern with Ms. Jahoda. She was the assistant principal of not just any school, but the Bronx High School of Science and in 2010, 20 out of 22 math teachers there filed a complaint alleging harassment. "There is uniform all around frustration. We get complaints every single day," said Melinda Katz, Queens Borough President. Katz says there is a larger issue throughout city schools. The process for choosing a principal is confidential, so parents and students don't know why with Jahoda's past she was placed at Townsend Harris High. "I do believe it should be a much more transparent process in general, clearly when there is such unrest. The parents and teachers deserve to know what's going on in the process," Katz said. In a statement the Department of Education said, "We continue to listen to feedback from this school community. Rosemarie Jahoda remains interim acting principal." The fear among parents and teachers is that the interim part of Jahoda's title could be removed instead. That decision is not likely to go over well. "We can never possibly be silenced," a student said.